Did you know rhubarb is a source of vitamin C, fiber and antioxidants? Because it is naturally quite sour, most rhubarb recipes include a load of refined white sugar. This compote uses less processed sugars that offer additional vitamins and minerals. 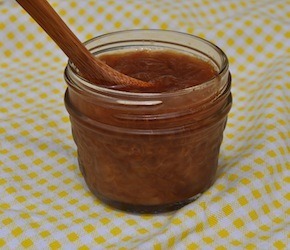 Try this compote on your breakfast porridge, over a scoop of ice cream or with barbequed pork or chicken. In a saucepan bring rhubarb, orange juice and sugar to a boil. Turn down heat and simmer until rhubarb is soft. Allow compote to cool and thicken. For added flavour add bit of cinnamon or freshly grated ginger. To give the compote a nicer colour add a few slices of beet while cooking and then remove.